Some European and international organizations offer scholarships to refugee students in developing countries. These scholarships can help to reduce illegal migration to Europe by giving young people the chance to continue their education in the countries of asylum. Dilyar Jouneydi is a 21-year-old Syrian refugee who has lived in the Kurdistan Region in Iraq for one year. His dream had always been to migrate to Europe. When he heard about a scholarship from the Albert Einstein German Refugee Initiative (DAFI), however, he decided to stay in the region. "In addition to the difficult economic situation here [in Iraq], one of the main reasons I wanted to emigrate is to continue my education. So if I get the scholarship, I will not go to Europe," he told Infomigrants. Albert Einstein German Refugee Initiative (DAFI) was founded in 1992 and provides scholarships to refugees in universities and technical institutes in their host countries. The scholarship is available in 36 countries and refugees registered in the program are from 37 countries. Last year, the initiative funded by the German government provided scholarships for 120 students in the Kurdistan Region for the first time. It also announced the opening of registration for refugee students this year from October 9 to October 21. The program is implemented in the Kurdistan Region of Iraq in cooperation with the UN High Commissioner for Refugees United Nations and the British Council. According to UNHCR in Iraqi Kurdistan, the conditions for applying for the scholarship are that the applicant is a Syrian refugee in Iraq, has a high school certificate with a grade of at least 60 percent, does not exceed the age of 30 and is not included in a resettlement or reunification program. The Kurdistani Democratic Students and Youth Union helps the students to apply for the scholarship. The Union official, Ahmed Mohammed Amin, said to Infomigrants that they are helping students with the registration to get seats in the universities. 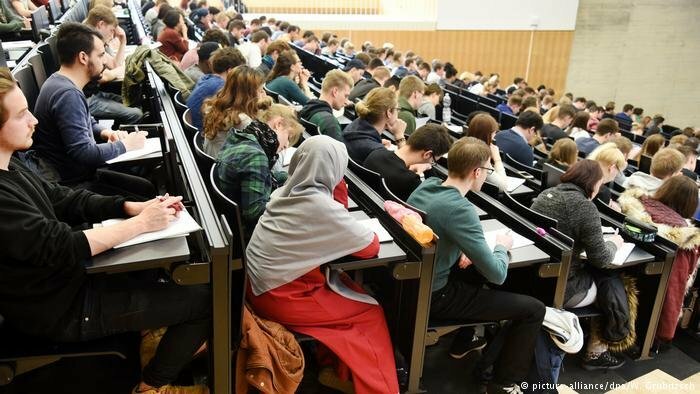 "Many Syrian students have taken refuge in Europe, whose main goal was to complete their study, especially after that the situation in Syria got worse. Therefore, providing an opportunity to study for young people will make them settle here," Mohammed Amin said. Rania Hassan, a Syrian refugee, got a scholarship last year to study law at the University of Salahaddin in Erbil. She says that the support of the organization is not limited to the monthly benefit of 380 thousand Iraqi dinars (about 320 dollars), but to follow up the problems of students, too. "When I was accepted last year, I encountered some problems related to accommodation, but the initiative helped me to resolve it," she said. Hassan, who has been living in the region for about a year and a half, said that such grants help students to settle in the region until they return home if the situation calms down. "It is expected that between 100 and 120 students will be accepted this year to take advantage of the scholarship," said Mohamed Amin said, adding that their union helped students last year to apply for another scholarship provided by another organization that called SPARC, that helped 80 students to be admitted to private universities in the region. "SPARC continues to grant every student who was accepted last year about 280 dollars a month in addition to advisory services," Mohammad Amin said. Albert Einstein German Refugee Initiative (DAFI) has also helped students in several other countries in cooperation with the UN High Commissioner for Refugees (UNHCR). In Turkey, its scholarship provides a monthly stipend of 1000 Turkish lira (about $ 270), a university seat and tuition fees. Dilyar Jouneydi hopes to study technical engineering in Erbil. "If I do not get the scholarship this year, I might think of going to Europe again, " he said.